My name is Angie and I love jars. Okay, I may be addicted to jars. Okay I might just need a support group. 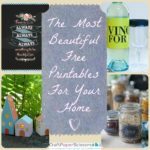 So addicted I even started a blog dedicated to them called Crafts with Jars. 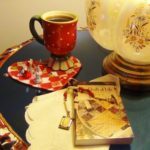 My favorite jar crafts are those that use jars in an unexpected manner. Maybe you think of jars as being for storage or holding candles. But some people think way outside the box and really take jars to an entirely new level. When you are sprucing up your home this fall, try thinking of jars in a whole new light. Yes light. Lights for your home using jars? Here are some of my favorite ways you can use jars as lighting for your home, you can always find more at my blog! 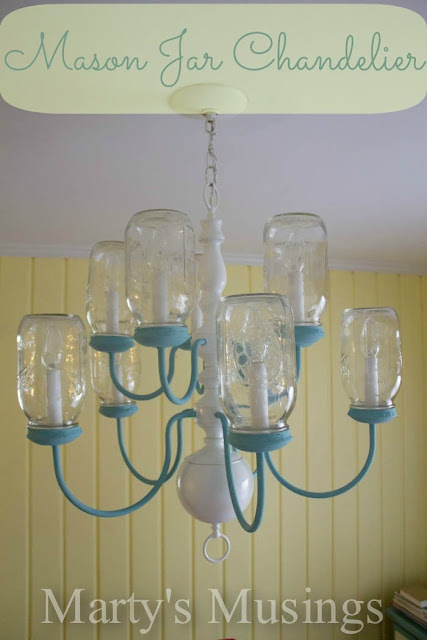 First up is a Mason Jar Chandelier from Marty’s Musings. What a great way to add some character to any old chandelier in your home. Don’t want an entire chandelier of jars? Let The DIY Village show you how to make a mason jar into a pendant light. Do you all know that the best part of a mason jar is that it is basically the exact size needed for lighting projects like these? 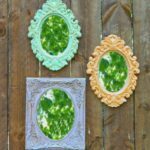 That makes DIY projects like these super simple to do. 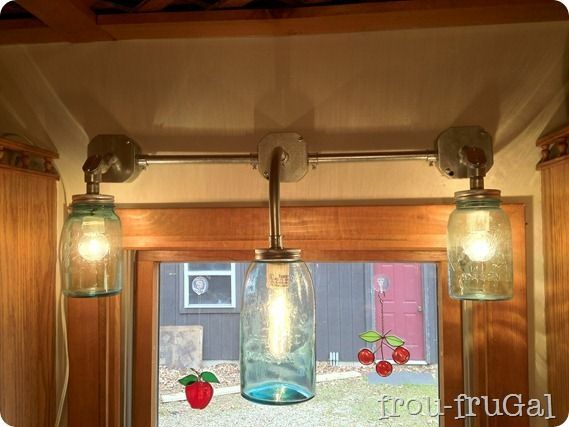 Some of my personal favorite jar lights just use the existing fixtures and add jars to those. You would be surprised how many light fixtures can use jars instead of globes. 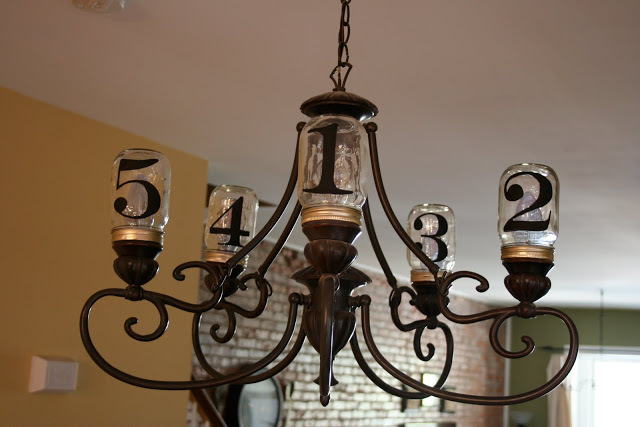 The Stories of A to Z added jars with numbers to her light fixtures. The addition of the numbers gives the jars a modern graphic feel.Would you use numbers? Maybe letters? 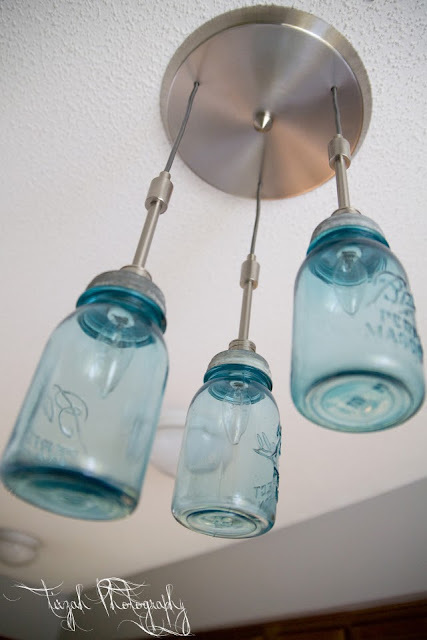 You can also add blue mason jars to an existing pendant light like Tirzah Photography. 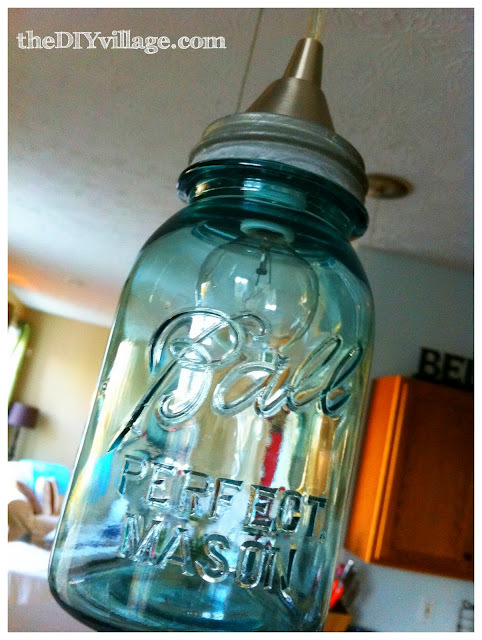 I must say that my favorite jar lighting projects use the blue mason jars rather then the clear. I love that classic blue vintage tint that these Blue Mason jar Pendant Lights have. 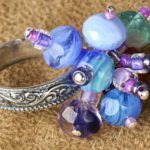 Plus Ball is making these blue jars again as a heritage collection so you don’t even have to scour your thrift store to find them anymore. 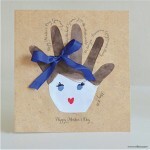 Many thanks to FaveCrafts and AllFreeHolidayCrafts for allowing me to guest post. Does this post just get you hungry for even more mason jar craft ideas? 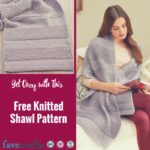 Please come on over and subscribe to Crafts with Jars for jar craft inspiration! 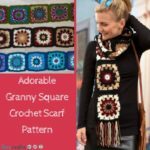 Thanks for including mine, Angie! Do u have ideas for wine bottles? I have lots of fancy bottles that I don’t want to toss out. Any ideas would be great. Thaxs. We sure do! Take a look at our list of 10 Things to Make With Wine Bottles. Thank you so much for including our pendant lights! I love the other lights so much!